The SYNTOPIAN VAGABOND is a mobile frame structure. As »vagabond« it travels from place to place. The SYNTOPIAN VAGABOND lingers temporarily in specific public spaces. Located on the streetside the passer-by is directly confronted with its presence. 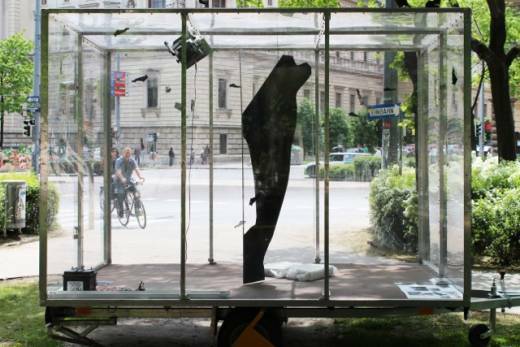 The SYNTOPIAN VAGABOND works with a mobile transparent space structure (3 x 2 x 2 m) and the black figure of the GOBOTAG. Together the casing of the SYNTOPIAN VAGABOND and the GOBOTAG function as a 360° lens, reflecting the surrounding. In this way the lense emphasizes the space between. Black Gobotags mark as well the transparent case of the SYNTOPIAN VAGABOND: The markings remind of dark silhouettes attached to windows as a warning to birds – cautioning about the unseen. Various actions taking place within the frame structure attract, distract and block the gaze of the spectator. The temporary coexistence of actions, frame structure and the specific location moderates a transdisciplinary relationship to the environment. The SYNTOPIAN VAGABOND is developed as an artistic tool, which transforms a specific location temporarily into a space of syntopic dialogue. Referring to the idea of Syntopy (»Syn-« and »topos«) – coined by the neuropsychologist Ernst Pöppel – the SYNTOPIAN VAGABOND brings together unrelated fields at one specific location. The result is an interface between the immediate environment and various disciplines, various projects and different places in the world. The SYNTOPIAN VAGABOND loses purpose as soon as it belongs to the milieu of its location. The SYNTOPIAN VAGABOND is a project by the fine artist MICHAELA ROTSCH. The transdisciplinary nature of this project enables the cooperation between institutions of arts and science. Designed as a project, which offers the possibility to participate ( -> ENTOURAGE), the SYNTOPIAN VAGABOND builds the artistic framework for the works of others.